It begins to become obvious in Breteuil and St. Leu; after Fontainebleu, in Montargis, Briare, Nevers and Moulins it is the norm. There are no women between 22 and 40 on the streets or in the cafés, eating in restaurants – who do not have a child. Thus, bars are full of older school kids, a few students; most are already paired-off, they hold tight to what they’ve got. In Nevers this came to a head: for here is a busy country town where the ideas of Sartre or De Beauvoir count for diddly rien. At the Grand Café the day is full of family, which means a constant drifting of daughters and mothers, children and fathers. Eating, drinking; and inside there is no music – not any all evening, not even the crowd-pleasing Rebel Yells, of – yes, even Paris. Saturday Night’s All Right for Talking here. 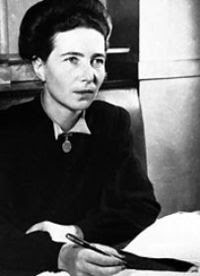 De Beauvoir loved walking on her own in the country; it was, after Sartre and writing, her great joy. Given Startre’s sack-track record, it makes sense. What is so interesting about these places is how the young, middle and old integrate. It is like watching a family – En Famille – from a distant planet where boredom, attention deficit disorder, obesity, and “bling” have all been eradicated. Perhaps these things are all on their way, coming with the wi-fi; waiting just around the corner to becalm the contentment of these towns. In Breteuil I stumbled on the Burgher Roi, but here – if they exist, which they must – they are just part of the life. Schools seem thriving, and in the one I saw in Abbeville, incredibly well stocked. Lively, but not threatening. Happy even. The main café in Nevers is a good example of community; I checked online and by phone with English and Americans: where are such “nodal” points in stolid, solid, Middle England or America? They don’t exist, we drive. We stay in our chateau. We watch the flatscreen. It is sunny, there is another electrical storm; France play Ukraine in an important Euro 2008 qualifier (there is a flat screen inside, muted, and barely three people watching it. When, very late, 11pm, Nicolas Anelka scores the second goal, there is a quiet whoop from about four people.) There are drinks, meals, conversation and flirtation – with the young. There are mothers everywhere, perhaps this is just the way of smaller towns, but it is the calm of it all that surprises after seeing “family” in any major city. There are streets to wander, pursuing a surrealist dream here – it is just that they come back to a centre, and at that centre there are people to meet and catch up with, grandmothers, fathers and kids. Being a stranger here isn’t a bad thing, there is no cowboy on the edge of town atmosphere, it is just that we are superfluous to the needs of anyone. Though our tourist revenues undoubtedly help. At eleven, then midnight – as the café moves to the fun-fair across the square, families stay together, children aren’t crying. One does nurgle when Anelka scores, but – hell, why not? The centre stays – it doesn’t drive away. I reckon the answer might just be yes – with the French Federal government. Now that would be interesting. This entry was posted in Nevers. Bookmark the permalink.